This exhibit is proudly presented in partnership with the Mi’kmaw Native Friendship Center in Halifax. 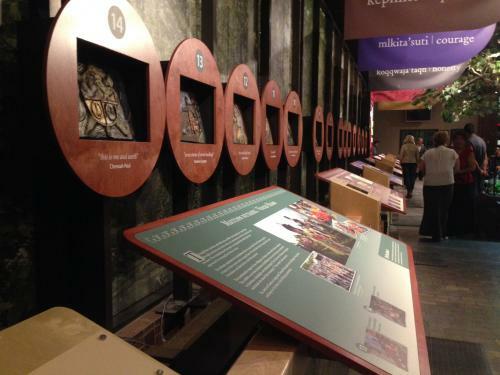 The tiles presented in this exhibit form part of a tile exposition at the Mi’kmaw Native Friendship Centre titled, “This Is What I Wish You Knew,” which explores Indigenous self-identity. Fifty community members from the urban aboriginal community in Halifax carved and painted their personal stories onto rectangular clay tiles. The project builds upon recommendations of the Truth and Reconciliation Commission of 2015, which documented the history and legacy of Canada’s Residential School System. The fundamental theme behind the tiles communicates the diversity, strength and courage of our Indigenous population in the Halifax region. Through these fourteen tiles, the artists share the challenges and diverse experiences of the Mi’kmaw community throughout our region. We invite you to enjoy the beauty of the tiles and listen as the artists reveal how their personal journeys are reflected in these works of art.